Kendal Fell is an upland area of Carboniferous Limestone lying to the west of Kendal. Quarrying and lime burning have been important on the Fell since the middle of the eighteenth century, when the area was enclosed and administered by the Kendal Fell Trust. In the early days the industry was carried out on a small scale by local limeburners, but the opening of the Lancaster to Kendal canal in 1819 greatly benefitted the industry by easing the transportation of fuel for the kilns and also the distribution of the lime produced. The Minute books of the Trust include an increasing number of references to limeburning after that date. For example, on 24 February 1824, it was resolved that “a halfpenny per bushel be charged to the Limeburners on all lime taken”. As the industry grew so did its effect on the environment. On 14 February 1846, a letter was sent to Richard Mattison, limeburner of Kendal, from the Clerk of the Trustees: “I am directed by the Trustees of the Kendal Fell Lands to give you notice that in case you [shall continue to] trespass by choking the Green upon Beast Banks with your horses and carts, proceedings will be taken against you for so doing”. As such problems continued a second Kendall Fell Act was obtained to replace the original enclosure Act of 1767 and give the Trustees much wider powers to control and manage the Fell Lands. As a result, the Trustees evidently decided to improve the efficiency of lime production. Entries in the Minute book for 1861 and 1878 include a detailed report on the costs of the current method of production, recommendations for an improved system of lime burning, and a more efficient method for working the quarries, together with costings for the production of lime under the improved system. As the industry developed further, it became increasingly concentrated in the hands of a few larger companies until, by the 1950’s, Pennington’s of Kendal was the only one operating. That remained a family business until, on 11 April 1975, it became a part of the Tarmac Roadstone Holdings Ltd. Operations at Kendal Fell Quarry were suspended on 25 August 1992 owing to the economic recession and, to date, work has not resumed. 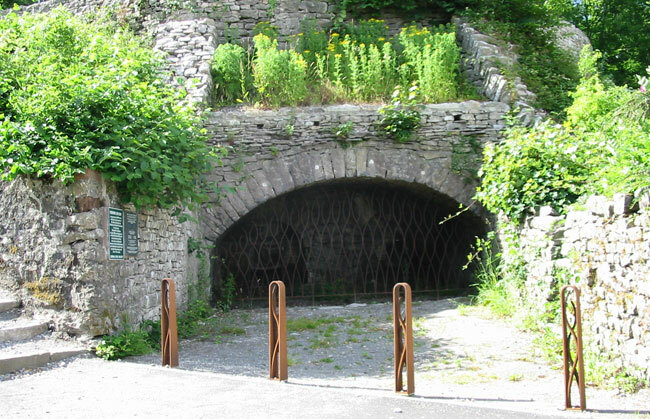 The most obvious and striking example of the early industry on Kendal Fell, apart from the quarries themselves, is the large, well-preserved limekiln standing just north of the Kendal to Underbarrow road at Greenside. This is a massive construction of dressed limestone, approximately 5 metres wide by 12m deep and 6m high. It has a wide, shallow, round arch, 4m wide by 3m deep and 1.5m high internally, and has two square drawholes lined with firebricks. The kiln has two circular pots, each approximately 2m in diameter and lined with firebricks, although both are largely infilled to within 0.5m of the top. It is in very good condition. The kiln itself is of an irregular shape, and is offset at an angle to the road with a short track to the front of the arch. The first edition of the Ordnance Survey 1:2500 plan, surveyed in 1858, shows this to be one of six limekilns on the Fell. Remains of two others are nearby, heavily overgrown, but there are no extant remains of the other three.